Narciso Rodriguez’s Narciso Eau de Parfum is a woody musk-based composition, which promises a velvety, sensual musky dry down. But like all Rodriguez creations, this scent is anything but linear and offers many twists along the way. It opens with a vibrant burst of white florals, gardenia and rose. This transparent cloud of innocence wafts above silky musk. These radiant top notes infuse the musk opening with excitement and energy – at the same time rich, warm, and embracing. Gradually, it settles into a woody heart of vetiver and two types of cedar: black and white, sensual and soft. The musk gently blends into the sharp base of woody notes- no strong masculine vibe here, just a gentle, comforting creaminess. A grounding accord of gardenia keeps Narciso EDP balanced at all stages, neither too mellow floral at its top, nor too sharp at its base. 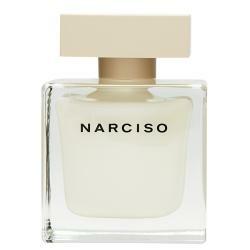 The result is perhaps one of Narciso’s most elegant and sensual creations, a woody musk scent that is as feminine, creamy and comforting as it is deep and elegant. A legendary, head turning perfume, just like the famous designer envisioned! I am a massive fan of all of perfumes with his signature on it, but I have to say that this one is probably his best.